With a dominate White upper, and Michael Jordan’s Baseball Career in mind, the Air Jordan Retro 1 (I) Barons Home will release April 5th 2008. 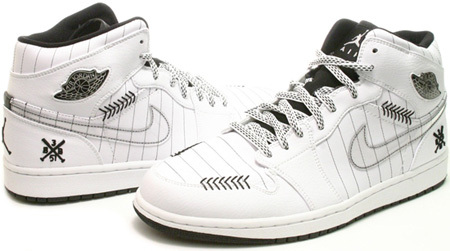 The Air Jordan 1 (I) Retro Barons Home features a White / Black – Silver color scheme. As you can see, the Air Jordan 1 (I) Retro Barons Home also known as the Opening Day features baseball stitching at the heel, pinstripes, and the Barons Team logo. A general release, the Jordan 1 Retro Barons Home retails at $100.